LEGUMINOSAE. Spectacular hardy small trees and shrubs valued for their pendulous yellow racemes and graceful habit. Hardy to at least Massachusetts (Zone 4) and standing poor rock soil. Pest free. Nick and soak seed to germinate in about 3 weeks. 'SCOTCH LABURNUM'. Bright yellow 1/2" flowers in long slender pendulous 15" racemes in summer. Hardy tree to 30 feet, with shiny deep green foliage. Mts. of S. Europe. Zone 3. Nick seed to germinate in 1 - 3 weeks. 'GOLDENCHAIN TREE'. Yellow, pea-like 3/4" flowers in pendulous 4 - 12" racemes resembling a yellow Wisteria, in May and June, followed by 2" pods. Graceful small tree to 20 feet or more, with trifoliate 3" leaves. Central and South Europe. Zone 3. Long-lived; one planted in 1601 was 56 feet tall in 1937. Very hard durable wood used as an ebony substitute. Leaves used as a no doubt dangerous tobacco substitute, and the seeds are rich in the poisonous insecticidal alkaloid cytisine. Nick seed to germinate in 1 - 3 weeks. COMPOSITAE. Tall annuals, biennials and perennials grown for ornament, food, seed oil and medicine. 'WILD LETTUCE'. Light yellow 1/2" flowers in large airy clusters. Hardy biennial to 3 - 6 feet. Europe. Sow any time, spring to late summer. Crosses of this with L. scariola sometimes show enlarged leaves more like garden lettuce than either of the parents. A re-domestication of lettuce might be an interesting project. The bitter milky juice was formerly used in medicine. Germinates best in part shade, in about 1 - 6 weeks. CUCURBITACEAE. 'GOURD'. Tender long-running tropical vines. Easily grown musky-scented plants. Give warm rich soil and full sun. Start indoors early in the North, and grow like squash. Pantropical and independently domesticated in both hemispheres. Includes the hard-shelled, white flowered Calabash Gourds, Cucuzzi Squash, Snake Gourd, and New Guinea Bean. Some lots more or less dormant. Clip ointed end of seed and use GA-3 for best germination in 2 - 3 weeks. Large apple-shaped gourds, dark green mottled with lighter clouds, ripening to brown. About 4 - 7 pounds. Good for crafts. Germinates readily. Very large round gourds, sometimes up to 4 - 5 gallon capacity. Used for containers, drums, etc. 'SLENDER VELVET BUSH'. Starry pink to white flowers. Shrub to 1 - 5 feet, with grey-green leaves. S. Australia. Zone 9. Stands drought and some frost. Nick or hot water to germinate at cool to cold temperatures, 2 - 4 weeks or so. 'PINK VELVET BUSH'. Starry pink or white flowers on a shrub to 1 - 5 feet, with narrow leaves. S. Australia. Zone 9. Germinates in 2 - 3 weeks at warm to cold temperatures, hot water or nicking may help. 'COAST VELVET BUSH'. Clusters of starry pink flowers on a shrub to 3 feet. S. Australia. Zone 9. Germinates in 6 weeks or so at cool to cold temps. Hot water or nicking may help. LEGUMINOSAE. Showy climbing and upright annuals and perennials, including the familiar 'Sweet Pea'. Grown for their lovely, often fragrant flowers of many shades of blue, violet, red, white or yellow. Excellent, quick-growing plants, perfectly adapted to trellises, fences, or allowed to sprawl as a colorful groundcover on sunny slopes. The perennials are easily grown in any garden soil, giving a good display year after year without attention. The annuals need a deep, rich moist soil and full sun. Pick pods to prolong bloom. Germinates in 1 - 3 weeks. Very fragrant light pink flowers. Heat tolerant. Introduced by Burpee in 1903. 'SWEET PEAS'. Lovely mix of fragrant large flowers in bright colors- reds, pinks, oranges, whites and purples. Withstands heat. Long-lasting cut flowers. This mixture is now difficult to find. LABIATAE. 'LAVENDER'. Aromatic perennials and shrubs grown for their attractive bloom, handsome foliage and delightful fragrance. They prefer full sun, and light, dry, limey soil, rich soil reducing yield. South facing slopes are best. Clip frequently to induce bushiness. Hardy to about zone 5. Sow in fall or spring, as they germinate best at cool temperatures. Or prechill 6 - 12 weeks to germinate in 1 - 12 weeks. Seed viable 5 years. Cut flowers in morning or evening, and dry in a cool, shaded place. 'TRUE or ENGLISH LAVENDER'. Lavender 1/2" flowers with purplish calyces, in long-stemmed spikes. Narrow grey green 2" leaves. Rounded shrub to 1 - 3 feet. Mediterranean region. Zone 5. An ancient herb, used by the Romans in their baths, and in their salads. It is mentioned by Shakespeare, and is much used to this day for strewing, perfume, scenting clothes, medicine, etc. A good honey source. Good cut flowers. The flowers were candied in former times, and they are good in salads, wine, and vinegar. Give seed 6 weeks prechill, or GA-3 and light, to germinate in 1 - 2 weeks. 'YELLOW FLOWERED' or 'CANARY ISLAND LAVENDER'. Small yellow flowers, fragrant leaves. Perennial to 2 feet. Canary Islands. Zone 8. Use GA-3 to germinate in 1 - 2 weeks. Aged seed best. MALVACEAE. Easily grown herbs and shrubs with showy Hibiscus-like flowers, and often maple-like leaves. Best in full sun and average soil, giving profuse bloom all summer. Curious disjunct range. 'TREE MALLOW', 'TREE GERANIUM'. Clustered purple-red 1 1/2" flowers with darker veins in the center, resembling the zebra mallow. Blooms June to September. Shrub to 10 feet, with downy 3 - 9" lobed leaves. South Europe. Zone 7. Very attractive in both foliage and flower, good in the greenhouse or on the coast. Nick seed to germinate in 1 - 2 weeks. "This was handed to me 'over the fence' by a neighbor in 1979. From that single plant I have had at least one on the property for almost 40 years."—L. Martinez, California. 'HENNA', 'MIGNONETTE TREE'. Very fragrant small white flowers with crisped petals on a small tree to 20 feet. Africa and Asia. Zone 9. Grown since ancient times for the leaves which are used to dye the hair a coppery reddish color. Bees are attracted to the sweetly-scented flowers, which are used by the Swahili for perfume. Medicinal. GA-3 helps germination, which takes 4 - 8 weeks or so. Germination rate is generally low. LABIATAE. Showy tropical African annual and perennial herbs and shrubs with tubular flowers in whorls. Easy from seed or cuttings. The perennials are nice in California and the South. Full sun. 'LION'S EAR', 'PRINCE'S FLAG', 'THIEF'S HEAD'. Showy, inch-long, bright yellow to orange-red flowers in large heads. 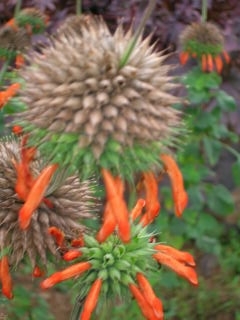 Annual to 4 feet, with broad, catnip-like leaves. The flowers are followed by attractive spiny seedheads that are useful in dried arrangements. Africa. Flowers well in a 6" pot. In Africa, night thieves would put the spiny seedheads in their hair to prevent being grabbed when fleeing. The flowers are eaten in Tanzania and the plant has many medicinal uses. Germinates in 1 - 3 weeks, but some lots are dormant and need GA-3. "All civilization does is hide the blood and cover up the hate with pretty words!"—U. K. LeGuin. LABIATAE. Aromatic shrubs with showy flowers, grown in warm regions for ornament. Includes one of our finest California natives. The large, hard seed may require scarification to germinate. CRUCIFERAE. Herbaceous plants, many eaten. LEGUMINOSAE. 'BUSH CLOVER'. Floriferous shrubs and herbs which are easily grown in full sun and almost any soil, best in uplands. Most are fairly hardy in the North, and they are extensively planted here and abroad for ornament and reclamation. Drought resistant. Sow in early spring, 1/4" deep, to germinate in 1 - 6 weeks. About 25% are hard and need nicking. Best inoculated with group 4 or garden bean inoculant. Seed viable 20 years or more. Bright rose-purple flowers profusely borne in racemes along the branches, bending them with their abundance from July to October. Graceful shrub to 4 - 10 feet, with slender arching branches and oval trifoliate leaves. Japan, introduced in 1856. Hardy to Boston. Zone 5. Excellent ornamental, erosion control, and the seeds are good quail food. Extensively grown in Korea, where it is called the 'miracle plant' since it controls erosion, enriches the soil with its prolific nodules, provides protein-rich livestock feed, and especially for the stems which are a high quality firewood. Yields 2.9 metric tons of fuelwood per hectare cut one year after planting, and 6.1 mt/ha after 2 years (=11,000 pounds/acre). The blooms give high quality honey. Good deer browse. Young leaves and flowers eaten boiled or fried, seeds occasionally boiled with rice, and mature leaves used as a tea substitute. Leaves and root used in Japanese medicine. Germinates in 2 - 6 weeks. "Busy, curious, thirsty fly, Drink with me, and drink as I. "—William Oldys, On a Fly Drinking out of a Cup of Ale, (1696 - 1761). UMBELLIFERAE. 'LOVAGE'. A single species of hardy perennial herb grown for the seeds used as flavoring. Best in rich moist soil and full sun. Sow in fall or early spring to germinate in 2 - 3 weeks. Space 1 - 3 feet apart. Seed viable 3 years. 'LOVAGE'. Tall perennial with shining dark green leaves in mounds to 2 - 3 feet. Tall 6 foot flower stalks topped with umbels of small yellow flowers in June and July, followed by strongly aromatic seeds. Alpine Europe. Zone 3. The fresh chopped leaves are an excellent addition to salads, stews and soups. The thick leafstalks can be eaten fresh like celery or candied like Angelica. Dried leaves make a nice tea. Seeds and root used for flavoring cordials and in perfumery. Germinates in 2 - 3 weeks warm. PORTULACACEAE. About 20 species of attractive hardy perennials named for Capt. Meriwether Lewis of the Lewis and Clark expedition. Good in the rock garden or among alpines, best in very well-drained gravelly, sandy soil, kept moist in spring and dry in summer. Germinates irregularly, best after 4 - 10 weeks cold treatment, may take 13 days and up to a year; usually 1 - 2 months. Best at cool temperatures and light may help, try surface sowing. Abundant inch-wide flowers in shades of red, pink, orange, and yellow, often with striped petals. Hardy perennial to 6", with a rosette of succulent leaves. Zone 3. Prechill seed 6 - 8 weeks to germinate in 1 - 2 weeks. CAPRIFOLIACEAE. 'HIMALAYAN HONEYSUCKLE.' Himalayan shrubs with funnel-shaped flowers in nodding spikes. Easily grown outdoors in the South and in sheltered places in the North. Easy from seed, flowers in 3 - 4 years. Interesting plants. 'FLOWERING NUTMEG', 'HIMALAYAN HONEYSUCKLE', 'PHEASANT BERRY'. White 3/4" flowers in pendant 4" spikes, with claret-red bracts, in August - September. Shiny purple-black berries, Strong growing deciduous shrub to 6 feet, with 7" leaves. Himalayas. Zone 6. "Berries bitter but delicious with sugar and milk. Diluted with water, they make a refreshing drink, sweetened to taste. Unique flavor. My favorite soft fruit."—J.L. Germinates in 1 - 3 weeks.